Haifa (Hebrew: חֵיפָה‎ Ḥeifa (help·info); Arabic: حَيْفَا‎ Ḥayfā (help·info)) is the largest city in Northern Israel, and the third-largest city in the country, with a population of over 264,900. Haifa has a mixed population of Jews and Arabs. It is also home to the Bahá'í World Centre, a UNESCO World Heritage Site. Haifa, built on the slopes of Mount Carmel, has a history dating back to Biblical times. The earliest known settlement in the vicinity was Tell Abu Hawam, a small port city established in the Late Bronze Age (14th century BCE). In the 3rd century CE, Haifa was known as a dye-making center. Over the centuries, the city has changed hands: It has been conquered and ruled by the Byzantines, Arabs, Crusaders, Ottomans, Egyptians, and the British. 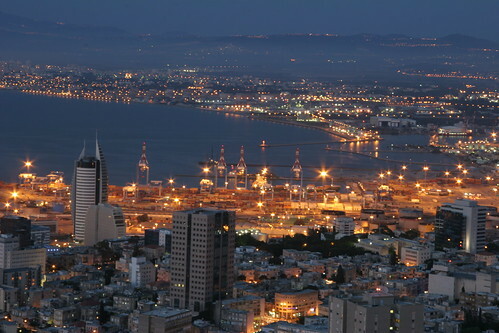 Since the establishment of the State of Israel in 1948, the city has been governed by the Haifa Municipality. Today, the city is a major seaport located on Israel's Mediterranean coastline in the Bay of Haifa covering 63.7 square kilometres (24.6 sq mi). It is located about 90 kilometres (56 mi) north of Tel Aviv and is the major regional center of northern Israel. Two respected academic institutions, the University of Haifa and the Technion, are located in Haifa, and the city plays an important role in Israel's economy. It has several high-tech parks, among them the oldest and largest in the country, an industrial port, and a petroleum refinery. Haifa was formerly the western terminus of an oil pipeline from Iraq via Jordan. Haifa (Hebrew: חֵיפָה‎ Ḥeifa (help·info); Arabic: حَيْفَا‎ Ḥayfā (help·info)) is the largest city in Northern Israel, and the third-largest city in the country, with a population of over 264,900. Haifa has a mixed population of Jews and Arabs. It is also home to the Bahá'í World Centre, a UNESCO World Heritage Site. Haifa, built on the slopes of Mount Carmel, has a history dating back to Biblical times. The earliest known settlement in the vicinity was Tell Abu Hawam, a small port city established in the Late Bronze Age (14th century BCE). In the 3rd century CE, Haifa was known as a dye-making center. Over the centuries, the city has changed hands: It has been conquered and ruled by the Byzantines, Arabs, Crusaders, Ottomans, Egyptians, and the British. Since the establishment of the State of Israel in 1948, the city has been governed by the Haifa Municipality. Today, the city is a major seaport located on Israel's Mediterranean coastline in the Bay of Haifa covering 63.7 square kilometres (24.6 sq mi). It is located about 90 kilometres (56 mi) north of Tel Aviv and is the major regional center of northern Israel. Two respected academic institutions, the University of Haifa and the Technion, are located in Haifa, and the city plays an important role in Israel's economy. It has several high-tech parks, among them the oldest and largest in the country, an industrial port, and a petroleum refinery. Haifa was formerly the western terminus of an oil pipeline from Iraq via Jordan. This Weblo State asset is Available. Make an Offer or Bid Now to become the New Owner and Governor of this State Asset. HI, no top ten businesses in that city ? Beautiful!! !I hope in 15 months from now weblo will have given us 3D features!!! Once Again, a very nicely done site mr. steinomite. Beautiful place and another great site from the Steinomite! It's splendid beaches, resorts and holiday atmosphere! The wild and fun Night Life! The great Educational Facilities available! The Historic sites and areas around the City!